While I’ve owned this book for a while, the only reason I read it this month was because I watched The Duchess. 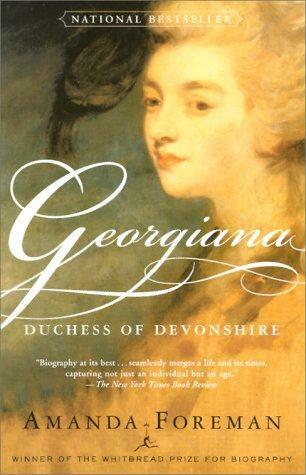 That movie was amazing, but it also made me very interested in the real Duchess of Devonshire. Watching it, I kept Googling people and things to read up on them, to see if the movie was accurate. When I realized my interest, I started looking for books about her. And then I realized that I did, in fact, own a book about her and decided I was going to read it in January. Now, the book went through its periods of waxing and waning. There were times I was very interested and absorbed every bit of information, and there were times where I skimmed for pages on end even though it was probably interesting stuff. Sometimes, that’s what my brain does while I read biographies. But, overall, I gave it four stars because it was interesting. I retained more than I skimmed, basically. Georgiana was an incredibly complex woman. It was so interesting to see how she grew and changed over the years and how, just before her death, she finally began to discover herself. She was incredibly influential, yet she found it hard to find herself in the sea of people who were more established than she was. Her life was a hard one, I have to say. And, some of it, was of her own making. She constantly gambled and was in such severe debt that I can’t even imagine it. In their time, around $100,000 (or 50,000 pounds). And in our time? Millions that she lost to gambling. However, she was a very influential political ally to the Whig party. Reading about her activities was so interesting because it felt unheard of for the time, something Foreman pointed out by comparing Georgiana’s life to the restricted political life that women had in the nineteenth century. Her husband didn’t love her and constantly had affairs. He fathered a couple children out of wedlock. He had an affair with her best friend (and she stayed best friends with her throughout both of their lives). She had her own affair that resulted in a child. The book also wasn’t just about Georgiana, but also her family. Especially her younger sister, Harriet. Also, as an aside, the naming kids after people has to stop. Because Georgiana had two daughters that were named Georgiana and Harriet. Very, very confusing since I wasn’t always sure who was being talked about, although Foreman tried to differentiate them with nicknames. ANYWAYS, the book was a family drama. It tried to put everything in context and I appreciated that a lot. This book had a very interesting subject. I don’t know why Georgiana hasn’t been written about more. She’s such an interesting figure that it’s a shame she hasn’t been taken up by more people. After reading this, I really hope that people start writing more about her! Do you have a favorite under-written historical figure?